For many homeowners, the trees in their yard are more than just trees. They are very often used for shade in the summer, and if they bear fruit or nuts, then those things can be enjoyed. Some trees may have a treehouse built in them or a variety of different types of swings that are enjoyed by children and adults alike. Here are some ideas for that dead tree that you have in your yard. A tree that is not in any way a danger to the home or the people in there and is still standing can be made to look beautiful. The average person is unlikely to think of painting trees but it has been done not only by homeowners but even by cities in park-like areas where some of the smaller planted trees have died. Very often, a tree that has dyed can remain standing for many years. It is not that difficult to turn an otherwise drab looking dead tree into a work of art by just taking a couple of different colors of paint that go well together and make your design and painting from the base of the tree up to its branches. It can be made to be as vivid and colorful as you like and with just a little bit of artistic ability can be made into something that is as beautiful as the tree was when it was alive. Parts of the dead tree can very often be used to make highly unique and beautiful looking outdoor furniture. From a bench that you use near your garden to a seat that you have in your yard, there are many ideas that you can use parts of that dead tree for so that it is still with you and you are even getting great enjoyment from it. You do not have to be a master craftsman for this to come out very well. You can quickly go online and look for a few ideas or tutorials, and with a little effort, you’ll have something that is unique and beautiful. This type of project is one that is very suitable for the whole family to participate. It is likely that the entire family enjoyed the tree while it was alive and it’s a great project for parents and children to do together and something that can be experienced for years. Whether you make the furniture to use or just as a decorative item in your yard or garden, it will make a beautiful talking piece when you invite over guests. Very often the base of the tree can be cut into pieces that can then be set into the ground making a walking path through a garden or a part of the yard. Because the tree is natural, it makes a unique and beautiful natural walking path that is stable and attractive. It is another lovely way to take a tree that was enjoyed for years and turn it into something brand new that can be enjoyed for many years to come. Similar to the furniture, this is a project that is great for the whole family. It’s a chance for the family to get together and do something outdoors that can be made into a fun activity and that can be enjoyed after the work has been completed. It’s something that every time the family goes into the backyard they’ll remember doing together, and they’ll get great enjoyment out of it both for the attractiveness of it as well as the memory of having done it together as a family. The simplicity of making trellises and garden fencing out of branches of the dead tree is something that is so easy almost anyone can do it. Using these in vegetable and flower gardens gives not only something that is unique but is wholly natural and fitting for the garden. Instead of just using wire and plastic you’re able to use something that came directly from nature, and you have recycled the dead tree in a significant way that looks fantastic and serves a real purpose. These natural fences can be used to help train plants and vines and help them to grow upright. If you have a vegetable garden, it can be used to help tomato plants that grow upwards and allow for a taller plant that yields more tomatoes. It could even be a beautiful way to allow grape vines to grow. Most people would not think of this idea, but you can take sections of the stump that are all equally cut in size and just bore out a part of the top so that there is a place for the dirt and a way to use it as a planter. This gives an entirely natural container that you use as a planter along with whatever beautiful things you plant there that can be very attractive and highly unique. Using ideas like these is a great way to recycle and to turn the tree into something brand new and beautiful. Many of these projects are perfect for the whole family to get involved in and something that the entire family can enjoy both for the stunning effect that it creates as well as the memories that were formed in the process of producing the project. 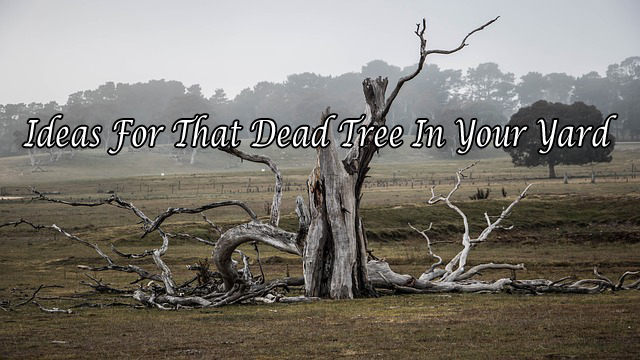 As mentioned above, there are many projects that you could do that allow the dead tree to remain standing without cutting it down. The first example suggested that you paint it a single color or a couple of colors to make it beautiful. But there is a time, and there are situations where a dead tree represents a danger to property and persons. If the tree represents a danger to your property, your neighbor’s property, or persons standing near the tree, then it is time to take that tree down. But you may be wondering how you know when it’s time to cut down a dead tree in your yard. Here we will take a look at some signs that it’s time to cut down the dead tree. Once you see the signs and you have determined that the tree is dead, then it’s necessary to decide whether or not it’s a danger or if it’s safe to keep it where it is until it falls on its own. You may want to know exactly how long a dead tree can stand before falling. The fact is there is no known data about it. If it is large enough that when it falls, it could hurt a person or animal or damage property, then it is a situation that requires you to remove it immediately. If you wait and allow it to fall on its own, any damage that is caused from that fall could be something you have to pay out-of-pocket for because many insurance companies will not cover the cost if you should have removed it before a storm or whatever cause that made the tree fall. Here we have looked at ways to make a standing dead tree look great and how to recycle a dead tree that needed to be cut down. You can visit our website www.evanstontreeservice.com for any tree service related information.